We have different origins, backgrounds and experiences, and would like to breath original inputs and innovations into the traditional world of sailing wooden boats. We want to promote an environmental friendly way for shipping organic goods from small coastal communities and European producers using the force of the wind only. Hawila will be available as an alternative way of transport for local organic producer to ship their organic goods with no greenhouse gases emission. The vessel can transport 55 tons of cargo and was built for this purpose in 1935. Hawila will stay in European waters, bridging South Europe with Northern Europe, creating a direct link between producer and consumer. We will collaborate and trade with other sailing cargo vessel to ensure diversity in the products we deliver, and help create an alternative green shipping solution. The ship would be sailed by the members of the organisation, volunteers and professional sailors. All profits from the export would be kept within the organisation and used to maintain the vessel. Full on-board sustainability is taken as a challenge and an experiment, trying to combine modern with ancient techniques in order to get as close as possible to our goal. On-board energy sustainability is easily achievable with today’s technology. Electricity for the navigation instruments, the pumps and lights can be obtained using solar panels and wind turbines. Heat pumps combined with stable seawaters temperature can provide constant heat inside the vessel and replace the need of traditional diesel or wood heater. Hydrogen fuel cells will be experimented on-board as well as a sustainable way to produce high amount of energy. The use of organic and alternative engine fuels will be experimented as well. The real challenge concern on-board food sustainability and water sustainability. To assess this problem we want to experiment and-board food production, using part of the cargo space to produce the food needed for the crew. Our overall aim is to experiment different techniques in collaboration with institutions and universities in order to achieve these challenges. Cultural integration, free art and knowledge exchange. We are a group of visionaries and we have the opportunity to make our inspirations reality! Our bond is the common understanding that music, dance and all forms of art should have more established participation in our everyday life. 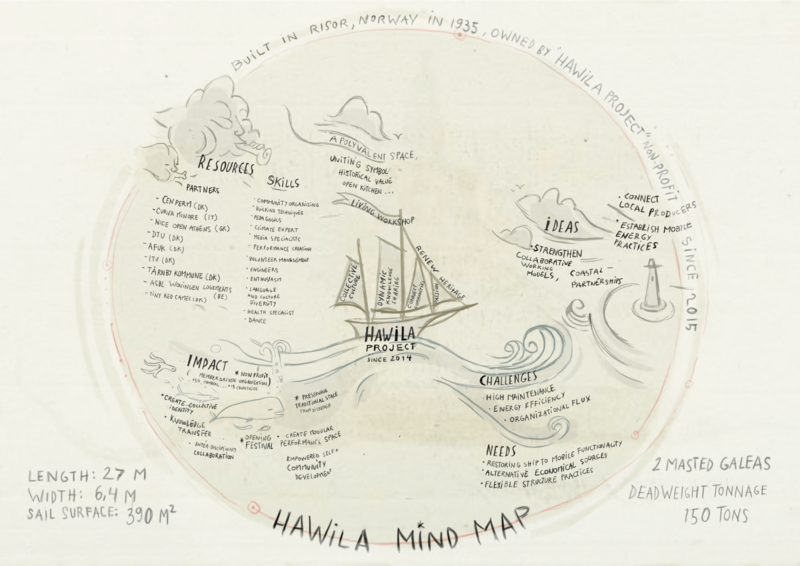 The Hawila became the base of our project and serves as a hub for meeting, exchanging and working. We want to explore the use of the boat as a platform for interactive art performance. Furthermore, we want to promote a free way of sharing knowledge through workshops taking place in the boat. Through our activities we aim to create a balanced environment including a wide range of ages, gender, ideas, cultures, perspectives and knowledge. We organise small weekly events, such as movie projections and recreational outdoor and indoor activities and establish on-board creative workshops with the participation of youth, volunteers and artists in residence. Whoever wants to participate in the restoration, learn how to maintain and later sail the ship and help developing the project can join the organisation. Sharing, learning and of course sailing are our key initiatives!